Children will love putting their own spin on this chocolatey pudding. Get them involved in mixing the cake and see what else they might like to add to the recipe, including some ideas from our cook’s tip, below. 1. Break the chocolate into a small pan, then add the butter and syrup. Heat very gently, stirring from time to time, until smooth and glossy. 2. Place the shortbread in a large bowl and stir in the almonds, honeycomb and apricots. Pour in the chocolate mixture and stir until evenly coated. 3. Tip the mixture into a 20cm loose-bottomed cake tin, patting down carefully to get it right into the corners. Chill for at least 2 hours until set. Slice into wedges to serve. 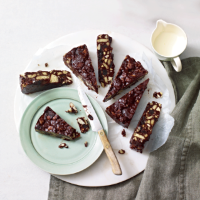 Mix things up by adding your favourite fruit, nuts or sweet treats. Try scattering pumpkin seeds over the top, dusting with freeze-dried raspberries, or stirring fudge chunks through before chilling.